Visit any city in sub-Saharan Africa and you’ll notice the busy streets are bustling with second-hand cars. Currently, the African auto market is dominated by used cars imported from Japan and the Middle East. These vehicles are the most affordable path to vehicle ownership in many African countries and have commanded the market for years. However, the world’s leading auto manufacturers would like that to change. The popularity of second-hand vehicles is a major roadblock for car companies looking to crack the promising African market by establishing local production. Consequently, auto giants like Toyota, Nissan, BMW, and others have come together to form the AAAM (African Association of Automotive Manufacturers). Together, their goal is to persuade governments to reduce the used car imports that have made the African market so impenetrable. Four years after its formation, the AAAM has begun to see changes. The head of Volkswagen in Africa says that the potential for new cars has gone up from 420,000 to 4 million in just two years. However, their efforts depend on how willing African governments are to limit second-hand imports. Additionally, a factor is how price-competitive new vehicle makers are with their tariffs. Even though Africa is home to 1 billion inhabitants, it only accounts for one percent of the world’s new vehicle sales, most of those going to South Africa. In particular, The AAAM is eyeing Nigeria, Ghana, and Kenya as potential manufacturing centers. These countries, eager to create jobs, have offered automakers tax holidays and duty-free imports of parts used in local manufacturing. Though the frameworks are yet to be finalized, companies are already investing millions of dollars in plants. Currently, the influx of used cars coming from Japan is the biggest obstacle to the developing market. Japan has strict vehicle regulations that force cars out of circulation after only a few years. 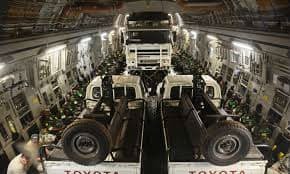 These vehicles are then exported to Africa and sold for cheap. In an attempt to curb the issue, Kenya plans to diminish imports of cars more than three years old by 2021. This regulation is expected to double prices of mid-range vehicles. Consequently, opponents say it will significantly hinder the middle class from owning cars. Additionally, used cars are a large source of tax revenue in many African countries, and governments will have to adapt to this loss. Is the move to establish local production a positive or a negative for the economy of Africa? Opponents cite the effort to dominate the African market as yet another example of foreign interests interfering with the welfare of the local economy. Others, however, claim it will help create new jobs and significantly boost the African auto market. What do you think? Comment below to let us know what you think!